I hope you had a great reading week. This is a weekly meme hosted by Kathryn at BOOK DATE! Post the books completed, the books you are currently reading, and the books you hope to finish at some point. THE PARIS SECRET by Karen Swan - review will be on November 15 - finished November 4. POISON by Galt Niederhoffer - review will be on November 21. SEVEN DAYS OF US by Francesca Hornack - review will be tomorrow - finished October 16. MILLARD SALTER'S LAST DAY by Jacob M. Appel - review is in the book's title - finished October 6. This book has been compared to A MAN CALLED OVE. CARNEGIE'S MAID by Marie Benedict - review will be on January 1, 2018. THE WOMAN IN THE WINDOW by A. J. Finn - review will be on January 2, 2018. THE WIFE BETWEEN US by Greer Hendricks & Sarah Pekkanen - review will be on January 9, 2018. THE ENGLISH WIFE by Lauren Willig - review will be on January 10, 2018. AS BRIGHT AS HEAVEN by Susan Meissner - review will be on February 6, 2018. WHERE THE WILD CHERRIES GROW by Laura Madeleine - review will be on February 13, 2018. SUNBURN by Laura Lipmann - review will be on February 20, 2018. THE FAMILY NEXT DOOR by Sally Hepworth - review will be on March 13, 2018. THE RECIPE BOX by Viola Simpson - review will be on March 20, 2018. I WAS ANASTASIA by Ariel Lawhon - review will be on March 21, 2018. NOT THAT I COULD TELL by Jessica Strawser - review will be on March 27, 2018. 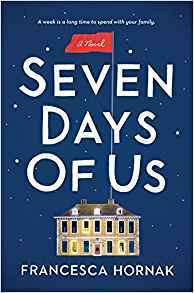 Just read Laurel Rain's review of Seven Days of Us so will be looking in to see your thoughts on it as well. Will watch out for your review of The Paris Secret as well. All the best for this week coming. I think you will like both books. Ooh nice! Those are new to me ones as usual! Hope you enjoy the reads for this week! What a gorgeous collection of reads. The mind boggles as to what to go to first. Loved Seven Days of Us...and I am eagerly awaiting The Woman in the Window and The Family Next Door. I have Poison...should start reading it soon. Have a great week! Thanks for visiting my blog. I will be interested in what you think about Poison. I just finished Wife Between Us and just started English Wife! Any thoughts on The Wife Between Us? I am looking forward to reading The English Wife. I'm anxious to see what you think of THE WIFE BETWEEN US. I read that. Let me warn you. First, this book is neither a romance novel or even romantic thriller. Although it does describe a love triangle, it doesn't exactly. It seems the ex-wife is stalking and terrorizing the girlfriend, but then it doesn't. No one in this book is as they first seem. It will feel like you are constantly having to revise your understanding of people and events. As a matter of fact, halfway through the book you may want to stop and reread everything you have read so far. Thank you for this information, techeditor. I do go back to the beginning or to other pages and re-read at times. Looks as though that might be the case here. The Paris Secret looks good.